Networking firm Cisco announced that it will be entering the tablet market with a new device dubbed the Cius. We covered rumors of Cisco's tablet plans earlier this year, when Cnet's Buzz Out Loud podcast received an anonymous e-mail hinting that the device was on its way. The e-mail detailed that the device would run on Google's Android operating system and would feature a front-facing camera, which, sure enough, is what the Cius features. 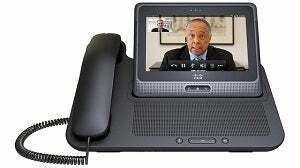 Cisco positions the 7-inch Cius as a mobile collaboration tool designed specifically for business use. The Cius tablet, pronounced 'see us', will integrate several of the firm's business applications, including WebEX, Quad, TelePresence and more. In addition to the official Cisco apps, Cisco also announced that Android developers are welcome to create independent applications for the device--with the help of Cisco's own SDK and APIs. The Cius has eight-hour battery life according to Cisco, and will also ship with an integrated Firefox browser. Under the hood, the 1.14-pound tablet is powered by a 1.6GHz Intel Atom processor, and supports 802.11a/b/g/n Wi-Fi, 3G, and at a later date 4G mobile networking. The Cius also includes a front-facing camera capable of shooting 720p HD video, as well as a rear-facing 5MP camera. You can also connect a headset via Bluetooth or through the Cius' micro-USB port. When not on the move, the device can be docked into an optional 'HD audio station' which offers additional USB ports, a wired Ethernet connection and a telephone handset and speakerphone. Cisco has posted a more detailed introduction to the upcoming device on their website, however no details on pricing is available. The Cius is not expected to launch until early 2011.